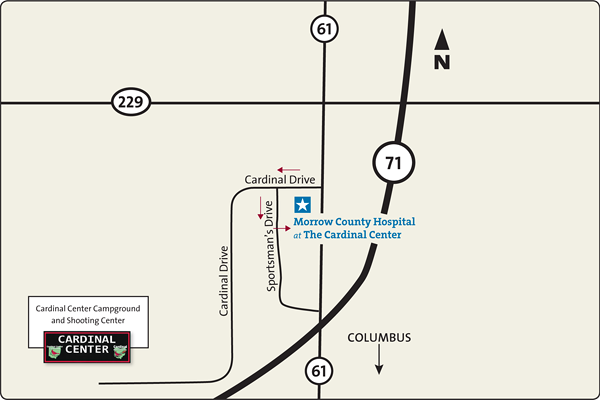 Morrow County Hospital at The Cardinal Center is located near the intersection of I-71 and State Route 61, where dedicated, highly trained experts provide the best care possible to meet your healthcare needs. Please note there is construction in this area affecting access to the Cardinal Center. The access road off of St. Rt. 61 (Cardinal Drive) will be closed for an undetermined amount of time due to nearby building construction. Patients going to an appointment at the Cardinal Center, please use the Farmstead Restaurant entrance and then turn right onto the access road (Sportsman’s Drive) behind the BP gas station and daycare to enter into the Cardinal Center parking lot. Please allow extra time coming to and from the Cardinal Center. *If driving from the south on 61 and you miss the NEW entrance, there is not a turnaround option for a while. *If driving from the north and you miss the NEW entrance, cross I-71 and turnaround at Arby’s/Pilot. Comprehensive primary care services for your entire family – ages one through seniors.